John has been performing magic for over 40 years and during that time has honed his skills to the highest level. He was elevated to the exclusive degree of Associate Member of The Inner Magic Circle with Silver Star in 2005, in recognition of his performing skills. Approximately 350 magicians hold this degree worldwide. The Magic Circle is THE most prestigious club for Magicians in the world. Basic membership is hard to come by but elevation to a higher degree is by invitation only after a performance to the highest standard. John began his act with a few well timed jokes and went on to explain that the reputed first known performance of a conjuring effect using balls is recorded as the magician Dedi in ancient Egypt in 2700 BC. Dedi had done other effects, such as decapitating a bird, then reattaching the head to resurrect it. John explained how this trick was performed using two birds. He went on to talk about the famous Harry Houdini, a Hungarian-born American illusionist and stunt performer, noted for his sensational escape acts. He first attracted notice in vaudeville in the US and then as “Harry Handcuff Houdini” on a tour of Europe, where he challenged police forces to keep him locked up. Harry Houdini died of peritonitis, secondary to a ruptured appendix,. on October 31, 1926, in Detroit aged 52. He believed in spiritualism and asked his wife to contact him on the anniversary of his death through seances but stopped after ten consecutive years of failure. John continue by explaining that the oldest trick in the world was the ball and three cups and gave some examples of seeing this performed all around the world. Similar to “Chase the Lady” using three playing cards. He demonstrated the former with the help off our acting President Roger Ranson. He showed us other illusions consisting of a metal cup a ball and He finished his act with a couple of amusing examples of mind reading using a member of the audience. An interesting entertainment following the festive season and outside the normal type of Probus talk. 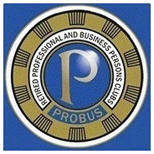 Ewell Probus is an autonomous Club for retired or semi-retired professional and business persons, normally aged 60 and over.